I don’t often get autobiographical on this blog, but lately, I’ve been thinking about the similarities and differences between Paul Ryan and me. I thought I’d share a few thoughts about how we came to different social and political conclusions despite having so much in common. We both lost our fathers at an early age. I was seven when my father died; Ryan was 16. He was the youngest of four children; I was the older of two. I’ve read that he had to grow up at an early age. I feel the same way about myself. In fact, on the morning I was told of my dad’s death, my mother, who was crying uncontrollably, asked me whether we should tell my 4-year-old sister. “We have to tell her,” I said. “You can’t hide it.” And with that, I made my first “adult” decision. We both had Christian educations. Ryan came up through the Catholic elementary school system, and I never attended a school that wasn’t Lutheran until I entered Kansas State for graduate school at the age of 23. We both continue to be Christians. We both had classical educations, grounded in theology, philosophy and the liberal arts. As a result, we’re both interested in ideas. Ryan listens to the Great Courses on topics like Voltaire; so do I, on topics like Reformation theology and classical music. We both read Ayn Rand at a young age. My guess is that we both admired the highly principled Howard Roark, the architect/hero of The Fountainhead. We both concentrate on fitness, at least in part because of seeing our fathers die so young. Ryan is fitter than I am, I’m sure, but on the other hand, he’s 20 years younger. I still run three miles or more at least three times a week, and I work with weights twice a week, so I’m doing ok.
Ryan chose law and politics as his career; I chose journalism and, later, public relations. I spent most of my career in corporate America, always in positions of having to advocate that my company should recognize and be responsive to the concerns of various groups we affected. Ryan’s family was better situated economically to handle the death of his father. My dad owned a grocery store, but he didn’t leave a great deal behind to help support us. I saw the value early on of having Social Security survivor benefits to help with our family’s expenses. As a result, I’m not sympathetic to wholesale modifications to the social safety net for those who need it. Lots of people in our family helped my mother (who never remarried) with her economic burdens, but our life would have been much more chaotic and uncertain without survivor benefits. Ryan took many of his economic principles from Ayn Rand and bought into the notion that the movers and shakers of the economy should be rewarded and unfettered by regulation and the burden of doing their part for the less fortunate. As a conservative Democrat, I believe that business is the backbone of America and should be helped to have the resources to compete and innovate. I think it’s naïve, however, to believe that companies always can be trusted to do the right thing because it will be in their best interests to do so. We need government to be a watchdog to hold companies accountable for protecting their employees and their communities. Ryan’s college years began in the late ‘80s; mine began in the late ‘60s. Oddly enough, cynicism about government really mushroomed during my college years because of the belief that officials lied repeatedly about events of the Vietnam War. Even so, we generally believed that as a society, we needed government to do important things that couldn’t be done well by private industry, such as building roads and defending the nation. We also believed that we, as individuals and as a nation, have an obligation to those less fortunate than ourselves. 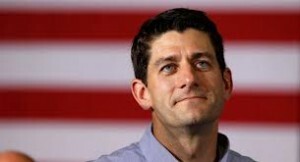 Ryan believes that, I think, but he thinks that nonprofits should take up this obligation. I think they can play a role but can’t address the whole problem. I honestly respect Ryan, but I’d never vote for him. I think he’s thoughtful and wants to make our country strong. But despite some of the similarities between us, we’ve landed on exactly opposite sides politically, and I think his ideas would destroy some of the basic values we cherish, including extending a helping hand (not a handout) to those in need. I wish him all the best, but I don’t want him to be any closer to power than he is now. This entry was posted in Politics and tagged Paul Ryan. Bookmark the permalink. Republicans don’t want government intervention until their district needs it; don’t want abortions until their daughters get raped; don’t care about educational reform because their kids go elsewhere; want boots on the ground in every Middle Eastern nation, as long as those boots are filled by poor kids, not their own.